A Whole-House Water Filter is a filtration system that is integrated into Plumbing pipes which serve all or certain parts of your home. The purpose of a Whole-House Water Filter is that it removes harmful water contaminates and chemicals from the water used throughout your home. The benefits are not only for water used for drinking, but also for removing chorine which becomes even more harmful when breathed as it is released into the air in the mist during hot showers. If you have a water filter to remove calcium and magnesium from hard water, then this special type of water filter is called a Water Softener, and you should instead put a checkmark for this home feature in your Home Wizard app. 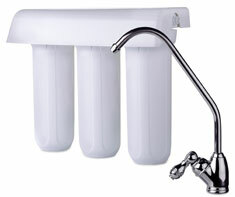 Shown in the 'Routine Care' section are the recommended routine maintenance tasks for your whole house water filter. The 'Q & A' section shows answers to common questions. And the 'Articles' section provides helpful articles about your whole house water filter.